Mary Weidner is a speech language pathologist and second-year doctoral student in Communication Sciences and Disorders at West Virginia University. 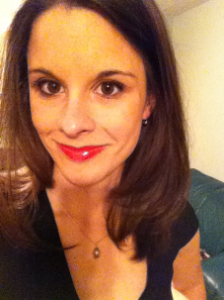 Her research interests include measuring and improving attitudes of young children toward peers who stutter. Mary is co-director of Stuttering U. and co-owner of MC Speech Books. Mary worked clinically at Children’s Hospital of Pittsburgh for four years before returning for doctoral studies. 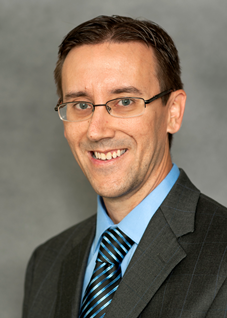 Craig Coleman is an assistant professor at Marshall University and a Board-Certified Specialist in Fluency Disorders. Craig a member of the Scientific and Professional Education Board of the American Speech-Language-Hearing Association and Associate Coordinator of ASHA Special Interest Group 4: Fluency and Fluency Disorders. He is the recipient of the Clinical Achievement Award of the Pennsylvania Speech-Language-Hearing Association. Craig is co-director of Stuttering U., co-founder of MC Speech Books and founder of the Virtual Stuttering Center. 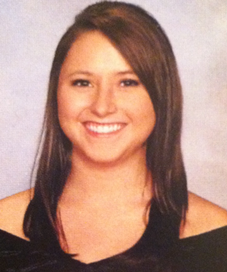 Katie Damron is a junior in Communication Disorders at Marshall University. She serves as a Student Ambassador for the College of Health Professions. Katie is currently involved in research to examine stuttering and bullying and also to increase community awareness and education about stuttering. Upon graduation, she anticipates continuing her studies in speech-language pathology at the graduate level. 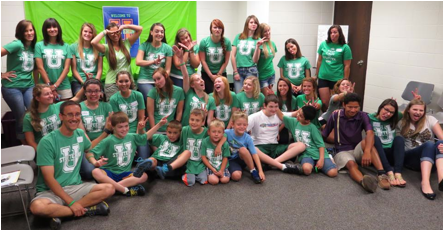 The first annual Stuttering U. summer program was held this past July, 2014 at Marshall University in Huntington, West Virginia. The 5-day event consisted of a two-day continuing education workshop followed by a 3-day camp for children who stutter and their families. The first two authors co-directed the camp with the help of nearly 40 student volunteers. Stuttering U. is unique in that it offers a continuing education workshop to speech-language pathologists (SLPs) who work with children who stutter. For the inaugural Stuttering U., the workshop was designed to provide participants with an overview of current research and clinical skills. Topics such as goal writing, therapy activities, and case studies allowed attendees to leave with real-world clinical tools to use with their clients. A pre-post test was distributed to assess participant learning. Results, which will be presented at the annual American Speech-Language and Hearing Association (ASHA) Convention this November, suggested a significant change in participants’ overall knowledge and clinical management of stuttering. Improvement was particularly notable in SLPs’ ability to define stuttering or identify effective treatment approaches to target negative reactions. Overall, the workshop was successful in providing clinicians with knowledge and understanding of comprehensive assessment and treatment of children who stutter. 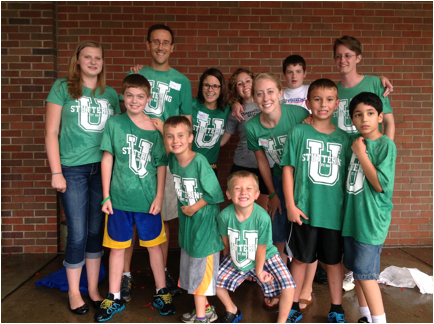 Attendees at the Stuttering U. summer camp were children aged 6 through 17, and their family members. The ultimate goal of the camp was to provide an opportunity for attendees to learn about stuttering, take communication risks, and develop meaningful relationships with others affected by stuttering. The camp consisted of a “camper track” and a “family track,” as well as combined group activities at the beginning and end of each day. The Stuttering U. camp slogan was, “Be Brave. Be Amazing. Be U.” The message was developed in order to convey that, although managing or living with stuttering can be challenging, it does not have to limit one’s life goals or freedom to be truly authentic. During the “camper track,” children participated in both stuttering-related and traditional camp group activities as well as individual treatment. All activities were aimed at facilitating improved communication, building relationships, and improving overall self-confidence. Throughout the camp, children created tri-fold displays about what stuttering means to them, which they then presented to their families and other participants at the closing banquet. In addition, they took risks, both related and unrelated to communication, such as purposefully stuttering in public and climbing a 37-ft rock wall. Most importantly, the children were able to meet other children who stutter. It was remarkable to witness the campers’ growth both in their communication and confidence over the course of the camp. For the family track, topics included discussion of the causes and nature of stuttering, the stuttering experience, and how to best support the needs of the child in the home, educational, and social settings. The camp directors held a consultation with each of the families in order to address any questions, concerns, and discuss a plan of treatment for their child. Parents consistently noted that the family track helped them to better understand stuttering and learn more information about how to help their child. Based on the success of this camp, Stuttering U. will be an annual event. We hope to continue to grow the camp and make it a life-changing experience for professionals, students, families, and most importantly, children who stutter. Through collaboration and team building, we can improve the lives of children who stutter. Children can learn that it truly is ok to stutter and that they can be who and what they want to be. All volunteers and parents of campers granted consent for the publication of photographs and video content below. I am so very impressed by the work that went into creating Stuttering U. The message, “Be Brave. Be Amazing. Be U. could not be more appropriate for the young children and growing teens that you worked with. I am special education teacher back in school for speech pathology. Bullying is a current topic in the public schools and I think your idea and practices could open the eyes of many instructors and many of the activities and themes of you camp could be lessons integrated either by the SLPs integrated lessons or by teachers. As your program/ camp starts to grow do you have any thoughts about including school personal or education majors along with family, speech pathology majors, and practicing therapists? What a wonderful experience for all involved! Allegra, that is a great idea and one that we will certainly explore as the camp grows. It is always a balance of creating an intimate experience and providing enough depth. I think your point makes a lot of sense! What a great idea for children who stutter to be around other children who stutter. I am currently a graduate student to become an SLP and in my fluency class I have learned that people who stutter tend to isolate themselves. This camp is a wonderful place for children to know that it’s okay to stutter and meet other people that stutter as well. I am sure these children have made life long friends. You had talked about that each child revived individual treatment? What did this entail? I know that each child who stutters is different, but what were the main focuses? Thanks Kristin. Individual treatment focused on targeting reactions to stuttering and integrating the camp experiences on a personal level. We did not work on fluency strategies with the the children. The whole camp was centered on reactions. This is an incredible opportunity for everyone involved! I love how the camp incorporates learning opportunities for SLPs, children who stutter, as well as their families. This drives home the importance of treating more than just the child who stutters. The simplistic view of the camp slogan seems perfect in the realm of stuttering. I think that sometimes the bravery of the people who stutter often goes unnoticed, when in reality their bravery is displayed daily. You mentioned that with the family track there were discussions of the causes and the nature of stuttering. I am curious to learn which causes of stuttering were discussed. Thanks Megan. We consider stuttering to be a multi-factorial disorder. Personally, I view the genetics and neurophysiology as underlying “causes,” while environment and temperament help shape reactions to stuttering. Demands and capacities then influence how likely a person is to stutter in a given situation. And yes, simplicity is good! 🙂 Too often we complicate things to the point where others cannot understand them very well. As Einstein once said, if you understand something very well, you should be able to teach it to a 6-year-old, meaning you have the ability to simplify! How cool! It was such a good idea to include a continuing education piece into the camp. Being in my first semester of graduate school for speech- language pathology, many have discussed how many SLPs are afraid to work with PWS because so little is known about the disorder. As a future SLP this is a bit intimidating. However, it is good to know that there are informational sessions offered in order to become more knowledgeable in how to help PWS. It is helpful to know that this will be an annual even and potentially a visit of mine in the future! Thank you for the kind words! We would love to have you join us! This is a GREAT idea! I am a graduate SLP student and keep hearing about how isolated people who stutter feel. This camp makes them feel less so AND educates the family. I wish my college would do something like this. This brings me to my question, If someone wanted to do something like this, maybe in a smaller setting like a day long event. What tips could you offer them? We really enjoyed reading this paper and we can’t wait to hear about it at the ASHA convention! We do have a few questions for you though. We were just curious about how the campers felt about their experience and if you have kept in contact with any of them to see their progress as a result of the camp?If so what were some of the results you were seeing? We were also wondering what the SLP side of the camp was like, was it just presentations or were there different training activities? Thanks Keri and Shauni. For a few of the kids, we continue to see them in individual tx after the camp. They all came away with so much more confidence and acceptance. The parents all rated the camp very highly and all indicated they would return next year. We did pre-post measures on SLPs knowledge relating to the CEU event and we are presenting a poster on that at ASHA. The differences were significant and eye-opening! We look forward to visiting your poster! I loved reading this paper! I am currently a graduate student at Western Carolina University and study under Dr. David Shapiro. I have had the pleasure of taking his class this semester, so I feel what i’ve learned has already made an impact on my curiosity in regard to stuttering. I was wondering how you would perceive the children’s performances when given more direct and challenging tasks like purposefully stuttering? And also, you may have already mentioned this, but did you give a challenging task at the beginning of the camp and then a similarly challenging task at the end to see how the children progressed? If not, in what ways did you measure the progress that was made in each individual child? Hi Chandler, thanks for the kind words. We had children involved in doing more challenging tasks right from the beginning of the camp. We had them doing a pseudostuttering activity with grad students on the first morning as part of a scavenger hunt. For a three-day camp, we do not expect to see massive changes on the part of the child. What we have seen is that those children have been able to leave the camp more confident and comfortable with their speaking ability. That continues to play out with many of the children who continue to receive individual treatment after the camp. I am currently in graduate school and think it would be wonderful if my school did a camp similar to this. I love how your camp incorporated SLP education, family education and treatment for children who stutter. Your camp slogan is very inspiring and could not be more appropriate for the kids and teens that you served. Have you followed any of the kids/families that attended your camp? If so have they maintained the progress they made at your camp? How did you measure this? Thanks for the kind words. For a three-day camp, we do not expect to see massive changes on the part of the child. What we have seen is that those children have been able to leave the camp more confident and comfortable with their speaking ability. That continues to play out with many of the children who continue to receive individual treatment after the camp. This is such a great idea! As a graduate student I love the idea of just learning something and being able to put it to immediate use. I am wondering about the family response. Did many of the families learn new things about their children? Did they feel that what they learned was specifically formed to their child so they would be able to take these ideas home and continually support their child? I am also wondering some of the specific methods used with the parents. I believe that parent involvement is so important to a child’s success and I love that this camp targets them as part of the process! Thanks! The parent track was a very unique component of Stuttering U. We were able to provide group education several hours/day as well as a consultation with each pair of parents at the end of the week about their child. For the education piece, we discussed strategies to promote their child’s overall communication. During the consultations, we shared with them our observations, addressed questions, and provided feedback on their child’s treatment plan. Thanks for your message! I love this idea. What a great way to integrate the needs, experiences, and ideas of children who stutter, current SLPs, and current CSD students. I am sure everyone learned and grew so much from participating. I especially like how children worked on activities directly related to fluency as well as general confidence-building activities such as the climbing wall. Showing children they are good at something and can have fun doing it will also give them confidence when it comes to communication. I was wondering if most of the children involved are children that already regularly attend the university clinic? What did you find was the best way to reach out and find participants from within the greater community? Thank you! This is an amazing outreach program! I am so happy that it has been a success! The enthusiasm and involvement from the university is astounding and rightly so. Given only three days was it difficult to establish a rapport with some of the children? Based on literature it takes several sessions and meetings to establish rapport, however, this was basically several within each day, so I would think some would easily grow relationships but am curious if it was difficult for others. As a graduate student, I was hoping that this is open to all students, SLP’s and families to widen our scope of knowledge. Is this only open to those in West Virginia? 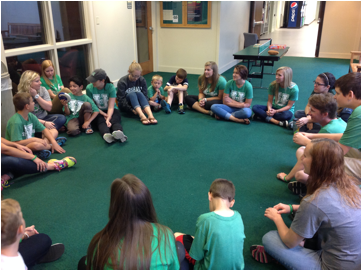 This camp was such a great idea to bring children who stutter and their families together! I know parents sometimes have a difficult time accepting that their child will stutter. Did this situation occur with any of the camper’s parents? And, how did you address it? We had such a great group of parent. They were completely on board from day 1. We also had two parent only education sessions each day of the camp, which really helped! Thank you all so much for this awesome post! I was truly moved by how much of an impact Stuttering U seemed to make on all of the campers as well as the volunteers. As someone who is from the Delaware/Pennsylvania area, I would love to learn about how to get involved with Stuttering U in the future. I am currently a first year graduate student studying Communication Sciences and Disorders at Western Carolina University and reading about this program has motivated me to get involved in a camp or related program such as Stuttering U. I know in your post it said that the age range of the campers was 6-17 years old. Were most of the campers more towards the younger or older end of that range? Or were the ages of the campers pretty spread out? Also, what was the most rewarding experience that you all had during those three days? I am sure the entire camp was rewarding in itself, but I am curious about whether anything in particular stuck out to you all. Thank you so much again for this post! Kelly, we are planning another one next year! Feel free to email me at craig.coleman@marshall.edu if you would like to be involved and attend. We had a pretty diverse group form ages 6 to 17, and everything in between. For me, the most rewarding aspects were: 1. Seeing the children in an environment were it was really ok to stutter. 2. Seeing our students learning about stuttering and getting involved. 3. Bringing this altogether after having “planned” and talked about it for several years. I think having a camp for children who stutter and for their families is an amazing concept! I am very intrigued by alternative ways to treat, teach, or impact clients who have a communication disorder (I am a graduate student working towards my degree for SLP). The other questions and answers have been wonderful to read so far! I was wondering if there was a noticeable difference in the participation level of the campers during the pseudostuttering practice? I have always wondered if younger children are more willing to participate or are more excited about treatment activities than older children and vice versa. I know that some children are excited to improve on a problem in their lives and others want nothing to do with it. We had no difficulty getting the kids to pseudo stutter, even in the first activity of the camp. I think there is something very empowering about being around others who also stutter. The camp was a good confirmation of the importance of that. You are right in saying that some children will not be interested in making the commitment. For the most part, children at the place might not be ideal candidates for a summer camp program. Wow, what a wonderful program! 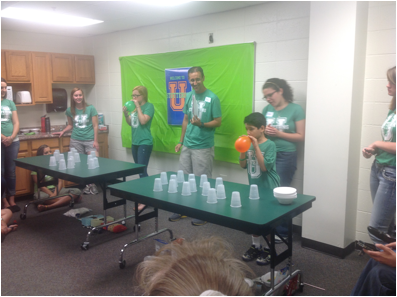 It was inspiring and humbling to read this post as well as view your video from the Stuttering U summer program. I think this program is a fantastic idea. When designing this program, how did you go about deciding what types of activities and education would go into it? Also, after this first year, are there any major changes that you see necessary for the future? This camp seems like a wonderful program with the potential to change the lives of many children and their families. Did your program reach out to families only in your area, or did you have families travel from a distance? If it was limited to your region, I think it would be beneficial to promote your program across the nation, or maybe other universities can develop programs similar to yours. Thank you for what you have done and the wonderful post educating us about it. Congratulations Craig and your team of professionals and volunteers! Wow, what an amazing camp! Thank you for having the heart and drive to commit to and create such a wonderful interaction between children who stutter, their families, and SLPs! I hope that you have inspired others to go forth and create programs similar to this that will make a difference in the lives of individuals who stutter, as you have inspired me to do so too. I know that this is meant to be educational but fun at the same time, but i was wondering, as far as the individuals who stutter, if you took any data over the course of the camp to compare progress, no matter what area it may be in (emotional, behavioral,communicative, etc.)? Thank you! We took pre-camp data using OASES and our own assessment measures. Three days is not much time to do a pre-post measure. We will likely do a 6 month follow up in January to see how the experience was after having time to reflect and make changes. This is such a great program to read about and I am happy to hear it was so successful in its inaugural year! I am a second year graduate student in speech language pathology and am currently taking a class on fluency disorders. I was wondering if you are aware of any similar programs like this across the nation? I was also wondering (sorry if I missed it somewhere if it was stated above), how many participants and family members were in attendance? Did you have the families or children do a pre and post test to measure their perspectives/feelings about the camp? Thanks so much! It’s incredible to see so many student volunteers participating in this too – I would love to see more of these programs start popping up in other states! Thanks! We had seven children and their families. We did a parent satisfaction survey with the parents at the end. All were extremely positive. Three days is not much time to do a pre-post measure. We will likely do a 6 month follow up in January to see how the experience was after having time to reflect and make changes. This is incredible! It’s so neat how the camp focused on bravery in regards to stuttering, but allowed the children to be brave together. As a SLP graduate student, my fluency class has focused on the importance of accepting yourself as a person who stutters. What a great way for the children and teens to gain confidence and meet others who have experienced many of the same things. I love that your slogan, it sends such a great message to the kids involved as well as to the public. It would be great if camps like this could be implemented in more locations! Thank you for positively affecting so many lives! What an amazing idea! I have heard (and participated) in clinics for adults, but this is the first I have heard of one designed specifically for children. I have worked with adults who have been told their whole life that stuttering was a bad thing, I can’t imagine the impact this camp has on kids at such a young age. I would love the opportunity to one day see a camp like this in action! This program sounds fantastic! I love that a CEU workshop is built into the camp – that seems like such a great way to keep SLPs informed on new developments with stuttering. I’m curious about how much of the camp was focused on intervention, and how much was focused on getting kids to increase their communication and feel a sense of community with other PWS and build acceptance of their stutters? Thanks Laura. Only one hour per day was spent on formal intervention. 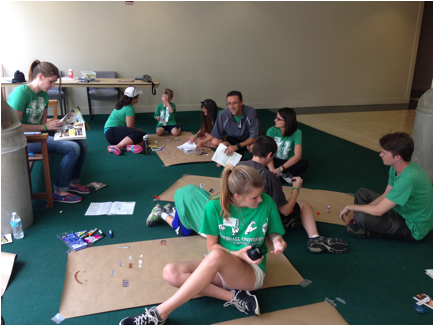 The rest of the activities were focused on communication, acceptance, and community! This is wonderful! I got chills just watching the video, as I’m sure these days at camp were incredibly formative for these kids and their families. Are there similar camps elsewhere anywhere in the U.S.? Were parents receptive to the information shared in their track? Thank you! Thanks for your message! There are a few other camps designed for children who stutter throughout the country, each with their own unique programming. The parents carried were very invested and receptive to our discussions about stuttering and it management. I enjoyed reading this paper very much! I am a graduate student in speech language pathology and currently in a fluency class. I think this camp is such a wonderful idea to build confidence in children who stutter. This semester I have two clients who stutter. Both of them seem to be having a hard time building their confidence. I saw where each child would participate in group activities and individual treatment. 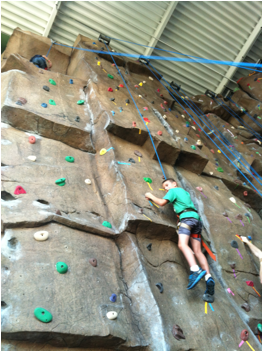 When did you feel it was the right time to introduce a challenging task such as stuttering purposefully and climbing? Were their other strategies you used? How was the participation in these tasks? Were many kids hesitant at first or did they jump right in? Thanks! Thanks for your comment. It was really interesting to see how some children “jumped in” right away while others took a bit of time to warm up to the challenges. We made it clear that nothing was “mandatory” but we merely provided opportunities, support, and encouragement. It was up to the individual child to decide when he or she was ready for those challenges.